After a few starts and stops due to weather and accessibility, the pool construction and renovation of the beloved Shipe Log Cabin is well underway! Phase 1 which included removal of the chinking and installation of new decking, zinc flashing and traditional shake shingles is nearing completion. Phase 2 will include new chinking, perimeter drainage work, new lighting, cleaning of the logs and application of a natural sealant to protect the wood from future deterioration. The materials for the reconstruction of the cabin will be in keeping with the original structure as much as possible. Material selections were vetted and selected by a team from the city spearheaded by Kim McNight, the Historic Preservation and Conservation Program Manager for PARD. As with all new construction, even those using “period” techniques and materials, it will take some time for the new wood and metal to acquire that “aged” look but we are confident it will patina nicely. Many thanks to James Nolan Construction and PARD Project Managers George Maldonado and Mike Jones for keeping the project rolling. A tip of the hat to the pool builders G Hyatt Construction Company for working with Friends of Shipe Park during their “big dig.” Most of all, Friends of Shipe Park wants to express our deep gratitude to the generous community members like you who have contributed so much towards restoring the Log Cabin to it’s rightful role as the “gathering place of Hyde Park.” This and other park improvements couldn’t happen without YOU! Friends of Shipe Park must raise $34,000 as a required matching component for a $50,000 Austin Parks Foundation Community Grant. This money will fund the Log Cabin Project which will restore the Log Cabin and the Wading Pool Project which will improve the swing set and current wading pool areas. With the help of neighbors, the Hyde Park Neighborhood Association, foundations, and community businesses, we plan to raise $34,000 in required matching funds by the end of October 2018. This will ensure that, when the new swimming pool is completed, other areas of Shipe Park will be restored and ready for use and enjoyment by Shipe Park users. Use this link only…not the ‘Donation’ link on the APF website to ensure the funds go only to the Shipe Park Fund. Checks may be made out to Austin Parks Foundation. Please write ‘Shipe Park’ in the memo line and mail your check to: Austin Parks Foundation, Shipe Park Sponsored Fund Account, 1023 Springdale Road, #4B, Austin, Texas 78721. WHAT IMPROVEMENTS ARE NECESSARY AND WHO’S PAYING? This 1930s structure has long been an integral part of activity at Shipe Park, serving as a shelter for birthday parties, concerts, picnics, social gatherings and the park’s restrooms. But it desperately needs attention! 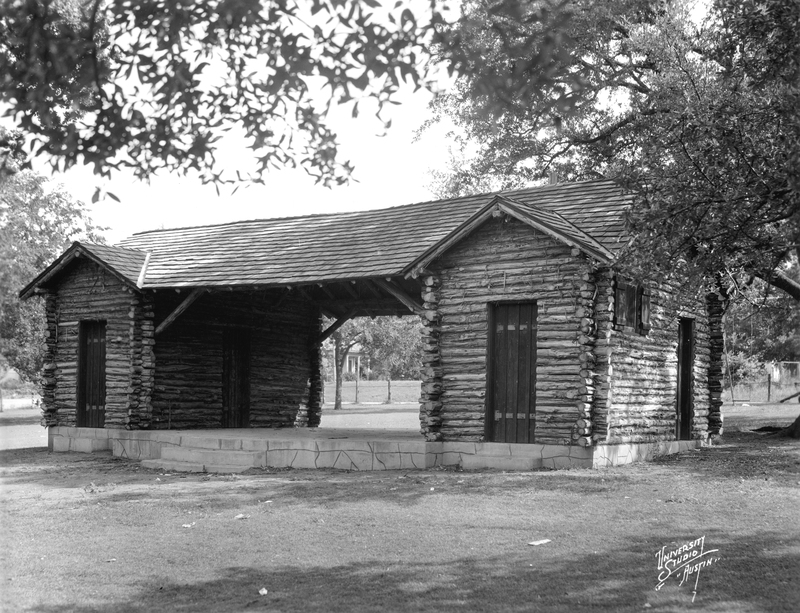 Friends of Shipe Park has been urging the Parks and Recreation Department to restore the Cabin for years and finally PARD is positioned to address the Cabin’s needs and has provided funding through the City of Austin Capital Improvements Project (CIP) to pay for the restored ADA compliant restrooms. However, private funds are needed for other critical repairs to the Log Cabin. Scope of Work Shingle and decking repair; structural remediation; log repair and new chinking between the logs. In November 2017, the Austin Parks Foundation awarded a $50,000 grant to Friends of Shipe Park to help fund the renovation of the Shipe Log Cabin and a Phase 2 plan called the Wading Pool Project. After reviewing the bids for the Log Cabin, the Austin Parks Foundation hired a builder, James Nolan Construction, who has a special interest in historical properties. PARD and Friends of Shipe Park will provide oversight and ensure that the work and materials are done in compliance with accepted standards for historic structures. Per the new Shipe Pool design, the Log Cabin bathrooms serve as two of the four required bathroom facilities servicing the pool thus preserving space in the new pool area and providing newly-renovated bathrooms year-round to park users. This part of the project will be funded out of the $3.1M in CIP funds for the pool. The Wading Pool is relocating to the new pool area. The old wading pool will be demolished, filled and regraded… leaving an unused area inside the fence. This project aims to restore that area for park use by converting it into an additional play area as well as solving the critical issues concerning the existing swing set area. Our beautiful heritage Live Oak tree, which has shaded the swing set for decades, is critically encroaching on the swing set, causing the removal of at least one swing. The City’s Urban Forestry Department has been working with Friends of Shipe Park for over a year to find a solution that does not include cutting any more branches off the old tree. Our best solution is to relocate the swing set to the Wading Pool area. Per code, any new swing set must be in a fenced area making the fenced wading pool area the best viable location. Additionally, this solution not only saves the tree branches but will allow for a conversion of the shady area to a mulched picnic and bench seating area for park users. The Austin Parks Foundation has awarded a $50,000 grant to Friends of Shipe Park on the condition that the community raise the extra money to complete both projects. The combined total of the Log Cabin and Wading Pool Project is expected to cost around $84,000 which, after deducting the $50,000 grant money, leaves a remainder of $34,000 to be raised through community fundraising. In 2014 Council Members Kathie Tovo and Laura Morrison led the effort to secure $3.1M in Capital Improvements Projects funding to build a new Shipe Pool. The planning and permitting process has been complicated and painfully slow. Because the old pool leaked badly, PARD closed it during the 2017 and 2018 swim seasons. The most recent delay came in July 2018 when the only contractor who bid on the pool construction was disqualified. This required the City to re-solicit bids. On August 16ththe City announced that three contractors had submitted new bids from which the City will make a final selection. While there could be further delays, the City’s ideal schedule is for construction to begin this fall and completed by June 2019. Friends of Shipe Park will keep the community updated on the revised schedule. Although not included in this fundraising cycle, here’s a glimpse of our future needs. The current playscape was added in 2004. A recent City of Austin “Playground Conditions Assessment” stated: “Shipe Playground has failing Poured-in-Place Rubber Safety Surfacing and severely compacted pea gravel that is non-compliant for the height of the equipment. The decks are rusted. The playground is in poor condition. The play structures have outlived their designed useful life.” The report estimates the replacement cost at $150,000. While the City of Austin’s tentative/proposed fall 2018 bond package includes funding for playscape replacements, Shipe is not on the list of park playscapes in most critical need of replacement. The surface of the court has developed a crack down the middle from one end to the other. The width of this cracking is uneven and presents an unsafe surface for players. While this has been reported to PARD, there are no current plans to repair it. Friends of Shipe Park is an informal group of neighbors dedicated to enhancing life in Hyde Park through events and improvements to Shipe Park. In five years, Shipe Park will be the best neighborhood park in Austin. Our activities have included the annual It’s My Park Day, tree plantings, ball moss removal, a sprinkler system, pool parties, movie nights, the pool mural, and parks advocacy. Current active members include Stacy Baker, Adam Wilson, Mark Fishman, Jill and Jack Nokes, Suzee Brooks, Alison Young, Lisa Harris, Haley Moberg, and Betsy Clubine. To join us or learn more go to https://shipepark.org, or contact Jill Nokes at jill@jillnokes.com or Alison Ycung at alisonyoungdesign@yahoo.com. Since 1928 Shipe Park has been an integral part of living in Hyde Park. Generations of Austinites have enjoyed Shipe’s amenities, and as Austin has grown, park usage has significantly increased. Shipe is getting “loved to death” and its facilities are aging (if not aged): the cabin was built in 1930, the wading pool in 1933, the swimming pool in 1934, the playscape in 2004. All of these facilities have outlived their useful lives and/or are no longer in compliance with established standards for parks and pools. FRIENDS OF SHIPE PARK IS DOING IT’S BEST TO PRESERVE AND IMPROVE SHIPE FOR THE FUTURE BUT WE NEED YOUR HELP!!! Everyone is eager for construction to begin on Shipe’s new pools and bathhouse. Despite some delays related to design adjustments and the permitting process, groundbreaking is still planned for late fall. The Friends of Shipe Park (FOSP) will provide a detailed timeline for construction as soon as we have the final information from the project managers. Meanwhile, FOSP is gearing up for a fund raising campaign to completely restore the historic log cabin. Although the cabin will be outfitted with new ADA accessible bathrooms, the budget for the pool renovation will not cover much-need repair of the cabin’s exterior, especially the roof. We would sure hate to see our poor neglected cabin sitting there surrounded by the new fantastic pool complex. To begin our neighborhood conversation of how to restore the cabin, FOSP wanted to share some of the cabin’s history with you. This information is taken from a thorough assessment of the structure that was prepared by Limbacher and Godfrey Architects, who were part of the design team for the new pool. The development of Shipe Park began in 1928 as part of a city-wide parks beautification program funded by a large public works bond issue. Within a few months of the bond election, the City Council authorized the purchase of the land from Monroe Shipe at a cost of $6,500. Hugo Kuehne, vice chairman of the newly established Parks Board, was among those who took an active role in the design and development of the park. Kuehne founded the School of Architecture at the University of Texas in 1910, and served as a professor until 1915. He continued to practice architecture in Austin until 1961, and designed a wide range of notable residential, commercial, and public buildings including other “shelter houses” at Little Stacy, Pease, Eastwoods, and West Austin Parks. The design of these shelter houses is attributed to Kuehne, based on photographs of them, including the one shown here in his personal files, now archived at the Austin History Center. The shelter house at Shipe is different from others because of its rustic cedar log exterior, perhaps inspired by log cabin that existed on Avenue G at the time of the park’s construction. The two pens of the “dog trot” log cabin flank a central breezeway, which was intended to be used for play and performances. These community activities continue today, with piñatas hung from the rafters and picnic tables arranged for birthday parties, as well as the breezeway serving as a stage for live music at It’s My Park Day events. The log cabin was built in 1930 and was the first of several structures built for play and recreation at Shipe Park. The Recreation Department held organized play programs during the summer months. The adjacent wading pool was opened at the site in 1932 or 1933. The park’s swimming pool was built in 1934, using $1,500 of materials and equipment provided by the City of Austin. Labor was provided through the Civil Works Administration, or CWA, one of many relief-era programs available to Austin at the time. The pool was opened on May 15, 1934, making it one of the oldest neighborhood pools in Austin. The major issues at the Shipe Park log cabin are related to structural degradation of the roof framing, and related deterioration of the wood shingle roof and decking. The log walls show some deterioration due to possible insect boring activity, and to rodent damage. The chinking material between the logs is uneven or missing, and needs to be replaced using uniform material according to historic preservation guidelines. Despite many years of “deferred maintenance” – one of many unfortunate outcomes of an underfunded parks department – the Shipe Log cabin is a remarkable and beloved structure unique to the park, and it’s important to preserve and maintain it for future use. Want to learn more and get involved? Stay up-to-date on this site and on the Friends of Shipe Park FaceBook page or email Jill Nokes with questions and ideas. Loving our trees! Thanks to an urban forestry grant provided through the COA’s arborist’s office, Friends of Shipe Park hired Just Trees arborists last month to remove 90% of the ball moss that was smothering the oaks surrounding the playscape, as well as the two massive heritage oaks that frame the cabin. Ball moss is an epiphyte or “air plant” member of the bromeliad or pineapple family. Ball moss is an organism that scarcely roots, but grows upon other plants, without being parasitic upon them, in order to be in a better position to secure light. They cling to branches and have adapted to obtain and store water and to catch drifting nutrients that cluster around their base, since they never actually touch soil. A little ball moss does not harm a tree, but if it begins to dominate the branches, it can contribute to a gradual weakening by preventing new secondary branches and leaves to grow, thus impacting the tree’s ability to sustain itself through photosynthesis. Combine the stress that comes with ball moss with other factors such as drought and soil compaction (from all the little feet running around the playground), and you can see how our precious oak trees were suffering. At the next It’s My Park’s Day to be held in November, we will mulch these trees again to help them recover and get back in good shape, providing much needed shade and cover for the park. There is some short term bad news at Shipe Park: because of the critical problems with the pool pump, plumbing, and active leaks in the pool system (the city estimates it would cost $100,000 to repair the systems at Shipe in order to operate the pools this summer), Shipe pools will not be opened this summer season. Although that is disappointing, there are a number of substantial improvement projects in the works that will be a benefit to our neighborhood going forward. It’s important to note that the improvement projects at Shipe Park need your support and engagement. Caring for our public spaces is always a partnership between the city and the community – events like It’s My Park Day where neighborhood volunteers work together with city staff to further improvement efforts are a testament to the potential of such partnerships. This kind of broad involvement and support is required to maintain and improve what is wonderful about Shipe Park! Will will also need substantial financial support from neighbors to make these projects possible. These fundraising efforts may take the form of matching challenges, events, and/or other fundraising efforts. Stay engaged and stay tuned as we continue to create the plan needed to make these projects a reality! Ball Moss Removal: Ball moss will be removed from the ancient post oak trees. This is critical to ensure the continued health and life of our cherished legacy trees in the park! Removal of a Substantial Dying Tree: The Post Oak that is just north of the log cabin and just west of the existing pool enclosure will be removed. Sadly, it has a disease that has rotted the core of the tree trunk, and it is in danger of falling. New Pool Construction Begins: The city will demo the existing big pool and kiddie pool and begin site work to prepare for the installation of the new pools. View the details of the pool replacement project here. Move Large Swings: The city will be moving the existing large swings (the ones north of the existing kiddie pool) because they are causing damage to the canopy of the established Post Oak tree nearby. A new swing set will be installed in the area currently inhabited by the kiddie pool. Create New Picnic Area and Add Ping Pong Table: In the former large swing area, a new picnic area will be created. The area will be created with a base of mulch, and it will have new picnic tables, benches, and a permanent ping pong table! Log Cabin Renovation: Friends of Shipe Park and the City of Austin are seeking funding to repair the sagging roof of the historic log cabin and to do the needed re-chinking of the log cabin walls. As part of the new pool project, the bathrooms in the log cabin will be renovated and brought up to code. All of these efforts are critical to the long-term health of this historic structure. New Shipe Pool Opens: The new and improved pools will be completed in time for the start of the summer 2018 pool season which usually begins soon after schools let out for Summer Break. Shipe Pool Party: Our annual celebration of summertime at Shipe Park will resume with the new pools as the featured highlight. Specific date TBD. 2020: Replacement and Upgrade of Playscape Area: The city is planning to remove the exist playscape equipment, fencing, and ground cover material and replace them with updated resources. This will be part of a city-wide effort to upgrade aging park playgrounds. Stay tuned on this website and on the Friends of Shipe Park FaceBook page to stay up-to-date on the city’s work, our park improvement projects, and fundraising efforts that will be critical to their success. Thank you for your love and care of Shipe Park, our cherished neighborhood park and community gathering place! 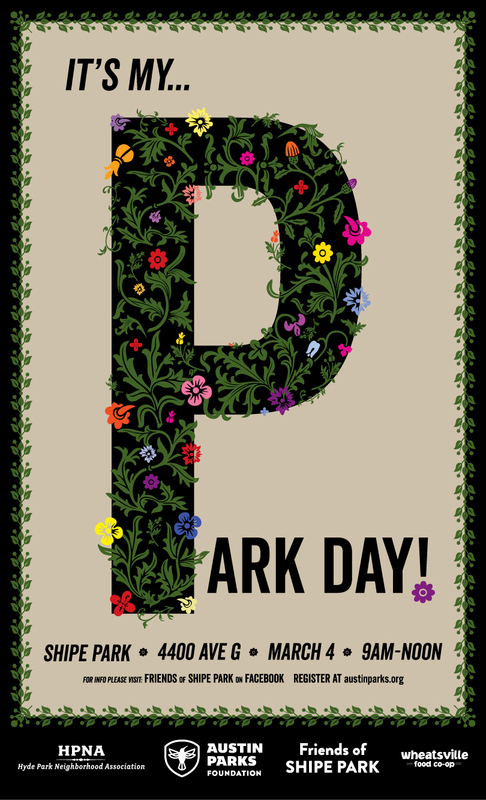 It’s My Park Day at Shipe Park is one short month from today! Mark your calendar now. Volunteer registration opens soon. Thanks to the amazing Clif Wright for our graphic design!